Reflect Cleaning Solutions provides window, conservatory, fascia and marquee cleaning services for both commercial and domestic clients. RCS use the latest in reach and wash technology from the market leaders Ionic, providing powerful hot water cleaning that can clean even the most stubborn of dirt and grime from all the hard to reach places. The reach and wash hot water window cleaning system with extension poles enables our team to clean higher, faster and safer. 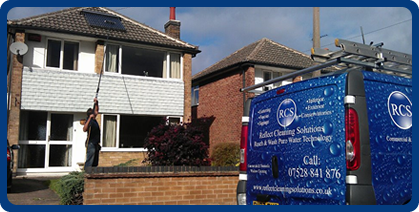 RCS provide window cleaning services to commercial and domestic clients throughout Nottingham and the surrounding areas. Our customer base includes shops, restaurants, factories, hotels, business premises, industrial premises, and households from window cleaning to conservatory and PVC cleaning. Try out RCS's (R) Natural Non-Toxic plant base cleaning products, you'll be amazed at its results on so many surfaces & what's great about it is that's its totally safe. As a reference, please provide either your business name or first line of your address with any payments, thank you.